For a Friday lunch nothing is better than a good quality sandwich to be enjoyed. I had been to one of Ottawa's best sandwich shops earlier in Little Italy, DiRienzo's. In the mood for another, but needing to do a couple of visits downtown, I thought I would try another highly rated Italian Store. 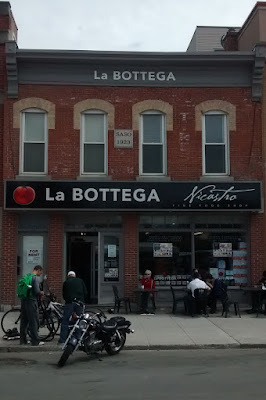 On Zomato La Bottega Nicastro (64 George Street, Ottawa) has had numerous reviews by both Bloggers and reviewers with none of them being negative. This is interesting as usually there is one dissenting opinion about a bad experience on most restaurants that have been reviewed multiple times. I visited at 11:30 A.M. figuring the store would be busy with the Friday lunch crowd from the ByWard Market businesses and tourists. The storefront itself makes the store look like a thriving business in a cramped historical downtown building. Things change though once inside. The inside is deep and winds its way around. In the front are display after display of Italian cheeses, produce and other ethnic products that an Italian grandmother would approve of. There is a small sit down restaurant section that serves wine and prepared Italian foods. I first thought this is where the sandwiches were but thought perhaps I would check out the deli area a little further along in the store. The deli area had three ladies behind the counter preparing sandwiches to your specifications. All sandwiches cost $5.31 plus tax ($6.00 even with tax). So a tip for you, load up on the filling toppings as it will not cost you any more! I approached the counter where there is an easy step by step menu to get you through positive ordeal of choosing your breads, toppings and whatnot before heading to the cash. I perused the menu changing my mind faster than a four year old at a McDonald's restaurant selecting a Happy Meal toy. Finally, I was forced to make a decision as one of the ladies behind the counter was ready. But that didn't take to long as the service here was quick and efficient moving customers through the sandwich making process. The Order: A Turkey Sandwich on Focaccia bread with Swiss Cheese, Mayonaise, Mustard, Onion, Lettuce & Tomatoes. In a matter of minutes I was handed a nicely wrapped sandwich and was off to the front cash to pay for my sandwich. The only spot of contention is the lack of seating to eat the prepared sandwich from the deli. Of course, in hindsight, I could have visited the restaurant and ordered a deli sandwich there with something to drink. Instead, I had visited the "To Go" section in the deli. No worries though as the ByWard Market is always a great spot to walk and window shop. Summer months in the nearby Major's Hill Park would provide a nice patch of grass to sit, contemplate and see the sights of Parliament Hill, the Ottawa River, the Alexandria Bridge and the Rideau Canal. But this being winter in Ottawa, I had other plans, take a stroll through the ByWard Market. I opened my sandwich which I originally thought was the length of the Subway 6" sandwich. Great, for $6.00 I felt a little jipped. But the more I ate the sandwich I realized the Focaccia bread was wider than the average Subway bread and thus probably just a big quantity wise as a 12" Subway sandwich. Taste wise the sandwich was solid. Freshly sliced deli turkey was quite evident. The mustard, mayonaise, lettuce and tomato added the delicious fresh deli taste that you would expect from a well prepared sandwich. The Focaccia bread was freshly made that day, but understandibly not warm out of the oven tasting. Overall, La Bottegga Nicastro is a great family owned spot to find a good Italian Deli Sandwhich that hits the spot. In the ByWard Market area skip the local Subway sandwich shop and head over to La Bottegga Nicastro for a fresher tasting sandwhich prepared by loving hands who know what they are doing. You can't go wrong with any of the bread, toppings or meat you choose. Just make sure while you are there you don't need a mortgage and a forklift to extricate yourself from the store with all the fresh Italian foods for sale.